Spain's Mediterranean coast offers a range of opportunites for holidaymakers and travellers, depending on the type of holiday wanted. Cheap-deal package trips tend to be based on the many major modern resorts that grace the coast from north to south. Great resorts, like Torremolinos near Marbella, or Benidorm on the Costa Blanca near Alicante, or Lloret de Mar on the Costa Brava are just three among dozens of generally characterless resorts catering for waves o f tourists from northern Europe, in search of a week or two of lazing on the beach just a stone's throw from their tower-block hotel. Admittedly, some of the worst atrocities of the headlong rush into tourism that occurred along the Spanish coast in the1960's and 1970's have now been pulled down or seriously remodelled; but at the same time, until the economic crunch that in 2007 largely brought things to a standstill, massive development saw long stretches between Barcelona and Algeciras transformed from traditional Mediterranean coastline, into ribbons of modern city with their accompanying leisure facilities of marinas, aqua parks, golf-courses, multi-lingual multiplex cinemas, and all the rest. Development has been most intense in the neighbourhood of the coast's main airports, in areas that are easily accessible. Yet even in the busier tourist areas, there are some small coastal towns that retain their character. 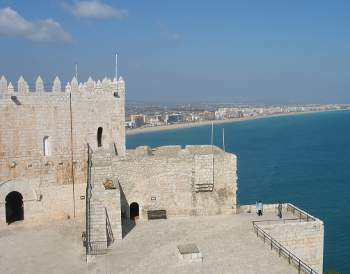 Though its suburbs have developed into a large resort, the historic small city of Peñiscola, with its city walls, its Templar castle, and its fishing port, comes as a delightful contrast to the modern resorts and housing developments all round. Development has been most intense where the coastline is flat; in places where the hills come down to the sea, and up and down the Spanish Mediterranean coast, there are still small towns that have remained essentially as they were before the age of mass tourism. Of course, they have all grown, and seen development of their own, but this has been more often in the form of low-rise holiday villas, clinging to hillsides or nestling in the pines. The Mediterranean without the tourists ? Yes, it's possible. In fact there are a surprising number of spots along Spain's Mediterranean coast that are not swamped by tourist development. As a rule of thumb, get more than 50 miles from any of the major Spanish Mediterranean tourist airports (Girona, Barcelona, Reus, Alicante and Malaga) and tourism development is much less intensive apart from around cities. Yet even close to cities there are protected areas of coast: these include some of the 14 principal coastal Natural Parks or National Parks along the Spanish Mediterranean coastline between the French and the Portuguese borders. As well as these important designated areas, there are also a lot of smaller or shorter stretches of the coastline that are - in theory at least - protected natural areas. 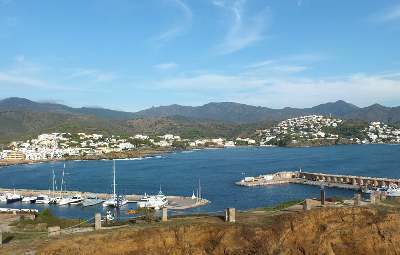 However there is perhaps only one very small village on the whole Mediterranean coast of Spain that has not had its face changed by an influx of tourists even if, today, few of its inhabitants are Spanish. The original inhabitants have moved out, as this village has no road leading to it, and can only be reached by boat. It is a beatiful idyllic spot, and its name and location will not be revealed here, in the hope that perhaps it can remain as it is. Apart from the Mediterranean, Spain has Atlantic coastline - from Tarifa to the Portuguese border in the south, and all along Spain's northern shores. Generally speaking, these areas are far less visited than the Mediterranean coast - in the south because of the distance, and in the north because the Atlantic coast and the coast of the Bay of Biscay do not benefit from the same reputation for sunshine and warm seas as the Mediterranean coast does. Tarifa, the most southerly town on the European continent, is a delightful spot, much favoured by surfers, as the coast here is rather windy. From Tarifa, there is a view over to the Atlas mountains in Morrocco, on the other side of the Strait of Gibraltar - through which Atlantic winds blow into the Mediterranean basin. Both east and west of Tarifa, there are some long stretches of undeveloped coastline. In the far southwest of Spain, the Doñana National Park is a large expanse of wetlands and dunes to the west of the mouth of the river Guadalquivir. North of Portugal lies the Spanish region of Galicia, with its largely undeveloped coast. Away from the ports of Vigo, Pontevedra, A Coruña and Ferrol, the there is little in the way of coastal development. Rocky and windy, this is Spain's Finisterre, the end of the earth.... Yet sheltered from the Atlantic surge and the winds that blow in off the ocean, there are plenty of small inlets with attractive sandy shores. As for the northern coast of Spain, it can be divided into two parts; east and west of Santander. To the east of Santander, in the regions of Cantabria and the Basque country the coast has seen a certain amount of modern development, specially close to the cities of Santander, Bilbao and San Sebastian; but there are still a few areas of coastal plain on this rugged Atlantic coast, buffeted by the storms of the Bay of Biscay, and even small coves and beaches, sometimes not too easy to get to, between the urban zones and areas of more intensive tourism development. West of Santander lies the rest of the Cantabrian coast, and the coasts of Asturias and of Galicia, the "Celtic" regions of Spain. The coast along this northwestern part of Spain is very attractive, with cliffs, rocks and sandy coves and beaches, but without the crowds. Until quite recently, it seemed to be a secret that knowledgeable Spaniards kept for themselves. Even the seaside resorts are small. 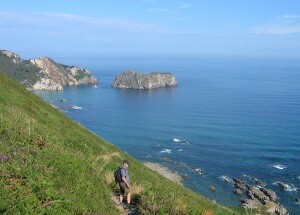 This part of "green Spain" is ideal for camping and outdoor pursuits. It has a temperate Atlantic climate, with warm summers and a chance of rain in any month, but not too much of it in the summer months - just enough to keep the fields green in a normal year. And inland, there are mountains to climb - including the impressive Picos de Europa, interesting places to visit, and a delightful rural area to enjoy..
Photo top of page - One of Spain's relatively uncrowded Mediterranean beaches. Where to stay in Spain - hotels, hostales and more. Getting round Spain by car - roads and driving tips. 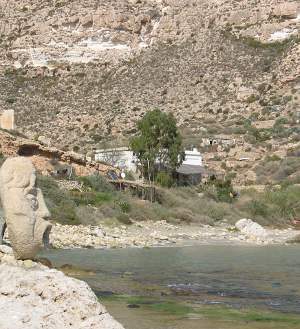 Is this the only remaining inaccessible village on the Mediterranean coast of Spain ?